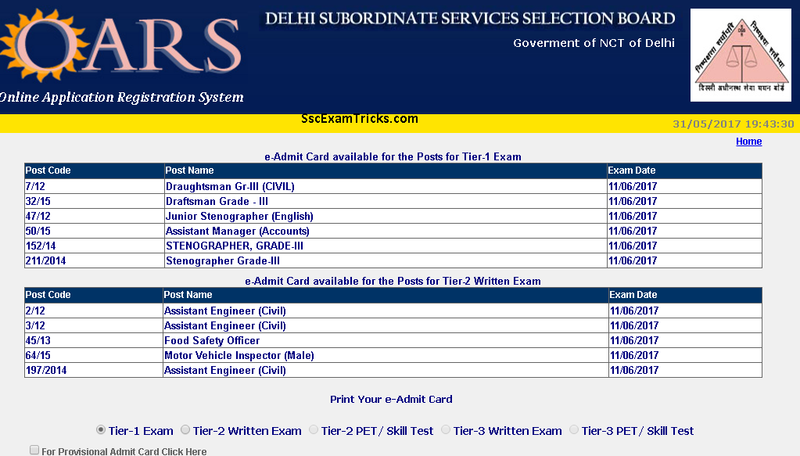 DSSSB Admit Card 2017 - Delhi Subordinate Services Selection Board (DSSSB) Tier I & Tier II Call Letter 2017-18 - www.dsssb.gov.in. 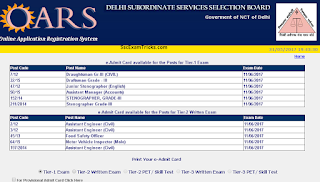 Delhi Subordinate Staff Selection Board (DSSSB) has released online Admit Cards/ Call Letters/ Hall Tickets for written exam which is going to be held on 31st May 2015 (Sunday) at various centres in Delhi for various Posts i.e. Assistant Engineer/ Junior Engineer/ Manager (Civil/Electrical) and Administrative Officer/ Zonal Revenue Officer/Assist. Assessor/ Collector/ Deputy Vigilance Officer/ Deputy Security Officer in various department of DSSSB. The latest news is that DSSSB JE/ AE Admit Cards has released on official website of DSSSB. A huge numbers of candidates had applied for these posts. Those candidates who have applied for DSSSB JE/ AE Exam 2015 and are waiting for ONLINE admit cards can download their Call Letter/Admit Card from the direct link provided in the end of the post. · Click on the link say JE/ AE Exam Admit cards. · Download DSSSB JE/ AE Exam Admit Card. The OMR sheet will be filled by Blue/Black ball point pen. No rough blank sheet will be issued for calculations/rough work in exam. The exam will be a multiple choice question paper containing 200 questions of 200 marks in which four options will be provided out of which candidates will need to choose one correct answer. The questions will contain two sections. In first section questions will be asked from General Awareness (20 questions of 20 marks), General Intelligence & reasoning ability (20 questions of 20 marks), Arithmetic & Numerical Ability (20 questions of 20 marks) and English Language (20 questions of 20 marks). In Second section, 100 multiple choice questions will be asked for a total of 100 marks. The exam will be of 2 hours i.e. 120 minutes.